The Tax Cuts and Jobs Act of 2017, which we will simply call the “Tax Act”, is not retroactive except for a very few unique expensing provisions, so for nearly everyone, your upcoming income tax filing due this spring for the 2017 tax year filing will NOT be effected. However, the changes are more significant than most realize, so now is the time to implement tax planning for 2018 to optimize the greatest tax advantages for your 2018 income tax filing. Below you will find a quick rundown of a few of the significant changes for both individuals and businesses. Be sure to visit our website for a slightly more comprehensive picture. Also, be aware that many of provisions of the Tax Act are temporary and thus will revert in the future unless Congress takes action to make them permanent. Most of the individual tax changes expire December 31st, 2025. We recommend you contact your Congressman and encourage them to address the temporary nature of much of the Tax Act now. List of Congress members. Finally, keep in mind that some of the old tax law provisions are grandfathered or may phase in after 2018; to clarifiy, some of the new tax provisions only apply to actions or transactions made starting in 2018 or may not start until after 2018. Individual Tax . . . the more comprehensive picture of the Tax Act. Business Tax . . . the more comprehensive picture of the Tax Act. The Tax Act itself . . . . a direct link to the actual full language. A long-term savings strategy like planning for retirement relies on small steps taken over an extended period of time. Make sure you’re on track by avoiding these common mistakes. Are you among the 71 percent of Americans who aren’t putting enough away for retirement? The most effective determining factors of a well-funded retirement are how early you start and how much you save. Aim to contribute the maximum amount allowable into your retirement accounts each year. If that’s a stretch, commit to increasing contributions to retirement accounts any time your income climbs, whether it’s from annual raises or salary boosts when you change jobs. If you’re early in your wealth-building journey or you anticipate a lower-than-usual income this year, it may be worthwhile to take advantage of your lower tax rate and make Roth contributions in your retirement accounts. Just make sure your employer-sponsored retirement plan has a Roth option. If your income disqualifies you from making Roth IRA contributions, consider Roth conversions. Many Americans who held most of their funds in a single company or sector of stocks learned this harsh lesson during the dot-com bubble. When the bubble burst between 1999 and 2001, so did a portion of those portfolios. And the same concern goes for tying up the bulk of your wealth in your principal residence. Not only is it time-consuming and costly to convert a home to cash, but you’ll also have the added stress of finding a new place to live. Diversification is key to avoiding this mistake. Whether retirement is a few decades away or just around the corner, the goal is to make steady progress in the right direction as you prepare for life after work. 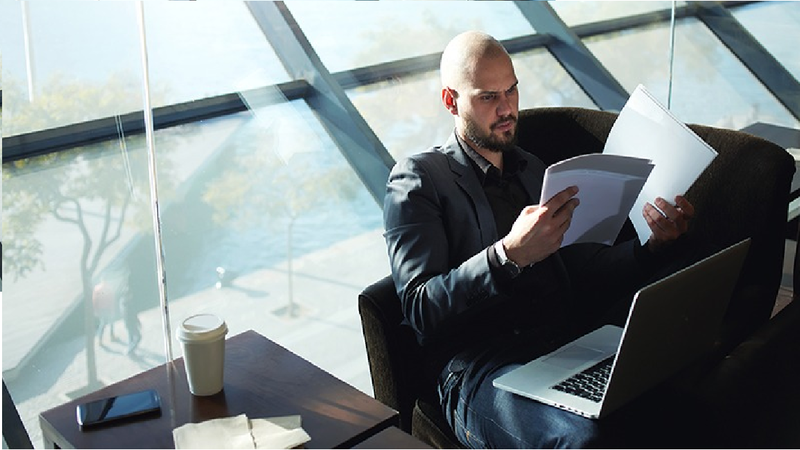 The information provided in Eddleman’s Economic Insight is not intended to be used as investment advice; rather it is provided as general economic news and information for your awareness or for discussions with your investment professional. Please consult your investment professional or CPA for advice specific to your situation! Past performance is not indicative of future results. It may seem early, but the start of a new year is an ideal time to get your ducks in a row when it comes to tax preparation. Use the following tips to get some work done now and avoid the panic of procrastination. The bulk of tax prep comes down to organized paperwork, so take stock of your documents. To report income, you’ll want W-2 statements if you’re salaried, 1099s if you do any freelance work and end-of-year statements for taxable investment accounts. Keep in mind that employers have until Jan. 31 to file and provide copies of W-2s and most 1099s to employees and contractors. One significant benefit to gearing up for tax season now: You can potentially owe less to the IRS by stashing away some funds in tax-advantaged accounts. You have until April 17, 2017, to max out 2016 contributions in a Traditional IRA, solo 401(k) or health savings account and potentially net a nice deduction as a result. Or if 2016 resulted in lower-than-usual income and you can afford to pay more taxes (but at a lower rate), consider whether a Roth conversion makes sense for the year. High-income earners should be aware of phaseout limits for itemized deductions, the Medicare surtax and a new higher rate for dividends and long-term capital gains. And if you were without healthcare coverage in 2016, don’t be surprised when the IRS levies a penalty fine. Square away your tax situation early in the year so you have plenty of time to identify potential gaps, valuable opportunities and strategies to protect your hard-earned wealth for this year and the next. If you’re like most of our clients, you’ve thought long and hard about the financial aspects of your retirement. You’ve likely worked hard and saved diligently. But, retirement for each person is different. Perhaps you plan on a working retirement with a new job and less stress, focused on what you love. Or, perhaps you plan to travel, play golf, or just rock on the porch. Or, maybe you want to downsize to a smaller house, spend time with the grand-kids, or take up sky diving. Who knows? Whatever the plan, don’t forget to consider the location you plan to call home. Where you “officially” call home can make a difference in your retirement lifestyle. Even if you plan to travel or live out of your RV, the place you officially live can impact your taxes and other living cost factors. Obviously, most people realize that retiring to California or New York will be generally more expensive than retiring to Tennessee. So, what are some of the factors to consider when picking a retirement destination? For most retirees, the two largest expenses in retirement will be medical care and taxes. Yes, a milder climate not only means a more enjoyable tennis match, but it can also mean lower utility bills. However, lower utilities are not likely to be as big of a financial factor as other considerations. Regarding medical expenses, BenefitsPRO recently completed an analysis on healthcare costs in the US. Now, keep in mind that the analysis merely compares Medicare premiums, but this can still be a fair comparison on what average medical costs by state may be because Medicare premiums consider medical costs as a major factor. Believe it or not, the cost to have a heart attack is different in different parts of the country. So, on average, Florida has the highest Medicare premiums running 35% more than Hawaii, which has the lowest. This makes sense from a supply and demand standpoint; there are many more retirees in Florida needing medical care, which likely means there are consistent strains on supply, which in turn drives up the cost. Tennessee did not make the top ten lowest or highest for Medicare premiums. Taxes are the other major factor for most retirees. Kiplinger recently listed six factors to consider when picking a retirement destination and each of the six factors were different types of taxes. Most retirees consider income taxes and while income taxes can be a major factor for some retirees, Sales Tax, Property Tax, and Estate Tax can be even more important. This is because once you reach retirement, you may have already earned most of your income; now it is more a matter of spending it. If income taxes are really your biggest issue, you might actually consider life outside the US. Over half-a-dozen countries actually have no income tax, but keep in mind, you’ll have to give up your US citizenship and other expenses may far outweigh the income tax savings unless your income is significant. Also keep in mind, the IRS will make you pay tax on your IRA before you expatriate, so don’t look to leaving the US as a way to avoid your Required Minimum Distribution (RMD). One income tax you may want to watch out for is income tax on certain investments. For instance, Tennessee has no income tax on earned income; however, it does have income tax on interest income over a certain level. These hidden taxes can sneak up on you and make a difference. Another somewhat hidden income tax is Social Security income tax. Some states have been moving away from taxing SS, but as of this writing, thirteen states still do tax it. If you are less affluent, then sales taxes and property taxes will likely be more significant factors. When considering property tax, keep in mind that most often this is a function of county government rather than state or federal government. If you own or plan to own significant amounts of real property, moving across the county line could mean a significant difference. Also consider if the county/state allows for a property tax “freeze” for owners who reside in the property. This can ensure that property taxes do not go up for you. As for sales taxes, this is a function of states and local municipalities, but usually more dependent upon the state’s rate. Again, moving across a state or county line or even out of city limits can be factor. Also be aware that the sales tax rate may vary by item. For instance, some states do not charge sales tax on food or may charge a different rate on certain large purchases. Finally, there are estate and inheritance taxes. The difference in these two is the way they are calculated. Estate taxes are charged to the estate, but inheritance taxes are charged to the inheritor, which may have differing rates depending upon whether the inheritor is a spouse, child, sibling, or unrelated. And, not only do the rates vary, the exemption amounts (how much you can pass on without having the tax) varies by state. Some states match the federal government’s exemption, but most don’t. In all determining where to retire is an important consideration for which weather may be a big consideration. Just don’t forget to look at the financial implications of location too. And, if you need help evaluating those consideration, call us at 877-5WEALTH. Well, it’s almost April 18th (the tax deadline is extended three days this year). If you’re like most people waiting until the last minute to file, you likely anticipate owing taxes instead of receiving a refund. And, if you owe tax, you may have higher than average income, which means at some point, you could be subject to Alternative Minimum Tax (AMT). What is AMT, you say? While individuals, corporations, estates, and trusts may all be subject to AMT, it is filers who claim more significant deductions such as dependents, mortgage interest and charitable deductions or who have capital gains, or higher state or local income taxes who are more likely to be susceptible to the AMT calculation. These tax advantages are not applied to the AMT calculation, like they are to normal federal income tax calculations. Also, the higher your income, the more likely AMT will affect you. How much income is necessary before you could be affected by AMT? Not as much as you may think. While every tax situation is different, we usually begin to see AMT negatively impact a married couple’s tax burden at around $200,000. According to the IRS, “The Alternative Minimum Tax [individual] exemption amount for tax year 2016 is $53,900 and begins to phase out at $119,700 ($83,800, for married couples filing jointly for whom the exemption begins to phase out at $159,700) . . . “. This impact can become greater as your income increases, but there is actually an AMT “Sweet Spot” where AMTs effect is reduced. So, how can you reduce the impact of AMT? One way is actually to further increase your income into this “Sweet Spot”. While AMT reduces your ability to take deductions, the top tax bracket for AMT is 28% instead of 35%. This means that the AMT tax amount grows more slowly than the regular tax amount. This Sweet Spot is different for everyone each tax year, but for most it will be at annual incomes between ~$500,000 and $750,000. According to the Treasury Department, 4,279 people renounced their American citizenship in 2015. This is up 864 from the previous high of 3,415 in 2014. From 2013 to 2015, 10,693 citizens have renounced their citizenship, which is more than the 10,189 renouncements in the previous 15 years from 1998 to 2012. 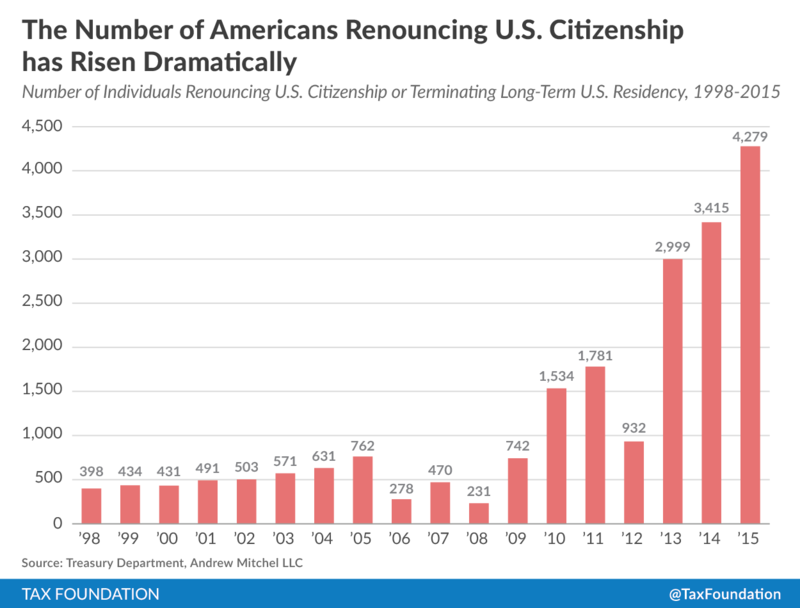 So why are so many more citizens renouncing their citizenship now more than ever? One theory is the Foreign Account Tax Compliance Act (FATCA) that was passed in 2010. This act introduced reporting rules for foreign financial institutions, as well as American citizens that hold money in foreign accounts. This bill was introduced to combat tax avoidance for Americans that hold money in foreign accounts, but it also makes life more difficult for Americans that are living overseas. Since the installment of this bill in 2010, 14,940 Americans have renounced their citizenship. In 2010, the first year after the bill was put into effect, the number of citizens that renounced their citizenship doubled. This bill makes the U.S. one of only two countries in the world that taxes their citizens on all income earned, whether they live in the U.S., or in another country. This means that American citizens working in a foreign country are taxed twice on their income. This double taxation could be one of the main reasons why citizens are choosing to renounce their citizenship now more than ever. As we all know, there are many scams taking place every day in our modern world, but one of the fastest growing is an IRS scam. So, with tax season fast approaching, we wanted to make you aware of the latest tactic by scammers to use you and the IRS. In short the scam involves fraudsters contacting you posing as the IRS to collect payment. First of all, the IRS will never call and demand immediate payment over the phone. If you have not received a bill in the mail from the IRS first, the call is more than likely a scam. Secondly, the IRS will not require you to make payments in a certain way, such as a prepaid debit card. The IRS will also not ask for a credit or debit card number over the phone. Finally, the IRS will never threaten to send police or other agencies to your home to arrest you for failure to pay, at least not over the phone. The IRS handles criminal investigations through the courts. If you do not owe any money to the IRS, hang up immediately. Do not give out any personal information. If you owe money, or think you may owe money, contact the IRS directly. They will be able to help you. You can also contact our offices and we’ll be happy to help you through the process if you prefer to have someone handle the issue for you. For more information on what the IRS will and will not do, visit the IRS website. For more infomation on filing your taxes, visit Eddleman Accounting.